My two younger sons and I returned yesterday from the Okanagan area. We were there for a Peewee ball tournament. Halfway through the fourth game (the team had won every game to that point, and excitement was surf-wave high) I noticed a whiff of smoke from the hillside on the far side of Kelowna. My younger brother, who had joined me to watch the game, said the smoke appeared to be close to my older brother’s home in Westbank…where I’d left my youngest son, Emmett, to spend the day with his aunt and uncle…and so he wouldn’t have to sit through yet another steamy hot Kelowna ballgame. We phoned to ask them if they were aware of it. (The Okanagan experienced devastating forest fires a few years ago.) No, they weren’t. Fifteen minutes later, we could see flames, and they were that much closer to my older brother’s home. We phoned again. By the time we arrived at the bottom of the hill–Glenrosa Rd–the police had already blocked off the area. So…why do I not have a photo to post? Because I didn’t take one. You know what a fire looks like. Certainly, with children’s literature and with educational materials, I’m a huge proponent of visuals. But I felt sickened by the number of people who immediately drove to the area and took pictures. Yes…that deranged woman, leaning out her window, screaming at folks to put away their cameras, and go home, get out of the way NOW…that was me. One young man actually had his girlfriend posing in front of the flaming hillside. “What are you doing?” I shouted. He looked at me as if I’m mad. We had to drive away; we couldn’t go up to the house and help. And we had to navigate through so many cars just to get out of the way. We spoke by phone until we couldn’t. Last we heard was that they’d reached the bottom of Glenrosa and were at the highway, and the highway was a gridlock…and there was a fire just started immediately in front of their vehicle. It wasn’t until an hour later that I received a text from my sister-in-law that they were out of the danger zone. That was a very long hour. Later, one of my nephew’s friends, who is living with them, drove Emmett to meet me late in the evening. This friend is an amazing young man, and he and his girlfriend walked–yes, walked–my brother’s two horses, all the way down from their house to safety. Such times are filled with minute-by-minute heroics and human emotion. And I suppose that is, at least in part, the draw for all those people who insist on being nearby to see and photograph and film. But if I had to share a photo with you, it would be of a candy wrapper. The friend’s girlfriend–I don’t even know her name (Thank you! )–bought Emmett a package of candy. She was buying a few things that she knew she’d need, such as pajamas, and she’d taken him into the store with her. She asked him what are his favourite candies, and gave them to him. When I met him, and hugged him, he had the candies clutched in his hand, and he kept them with him for the next day, and the next. He was slowly chewing on them as he told me about things he’d seen during his time near the fire. This simple gift of a package of candies meant so much to him through the time. That would be a good picture. With the weather we’ve been having, summer feels to have been around for awhile now. But for me, July 1st is the real first day. As of yesterday, my hockey poetry anthology project is a Go! I’m very pleased about this. Seems fitting, for Canada Day. I’ll be collecting hockey photos from across the country–so if you have something, let me know! 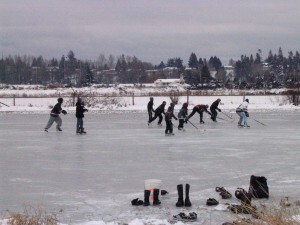 This photo is one of my favourites…the kids out on the ice by the ferry terminal, winter 2007. Love the row of boots in the foreground…and being West Coast, the shoes. I’ll still be looking for poems of particular form and content. Contact me, if you want to know more. The anthology will be published with Gumboot Books, in Fall 2010!